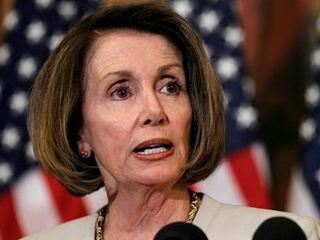 Speaker of the House Nancy Pelosi is heckled by Code Pink at an event in Washington, D.C.
"We supported Obama, we supported you, now 21 states are begging for money to help us save the community," a woman screamed at Pelosi. "You have made your point," Pelosi said in an attempt to quiet the protesters. An aide informed her that they are "throwing stuff." UPDATE: This video shows some of the protesters were anti-Israel. They hold a sign reading "Stop Funding Israel Terror."